In August 2018, a special jury in Colorado pressed charges against 16 narcotraffickers who moved cocaine from Mexico to the United States and laundered money through Chinese banks. The process isn’t new: In 2017, the U.S. Drug Enforcement Administration (DEA) warned about criminal groups in Mexico, Colombia, and Venezuela that used their contacts with Chinese mafias to launder money through banking entities in the Asian nation. 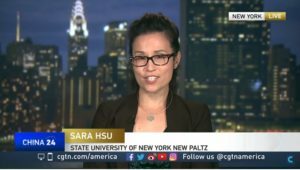 Sara Hsu, an associate professor of Economics at the State University of New York and specialist in the Chinese financial system, explains that the Asian nation is an attractive destination to launder money coming from Latin American criminal activities. One of the reasons is the strengthened link between groups such as Mexican drug cartels and Chinese mafias. According to Hsu, some of the most common money laundering techniques are the purchase of Chinese products and fake commercial exchanges through casinos in Macau and Chinese money exchange houses.